I did it. I finally finished Harper's quilt. Woohoo. This is by far the biggest project I have tackled to date. I really think that I spent way more time thinking about what I wanted to do and how I wanted to do it than I did actually sewing. It was a cold, dreary weekend so I had several uninterrupted hours on Saturday morning to knock it out. I can't tell you how happy I am to have this finished. It is far from perfect, but I am still proud of it. I took photos so that I could share the process with you. I decided to just stitch in the ditch, so it doesn't have a very quilted look to it. I was too afraid to do much more than this, maybe next time. Then I trimmed the excess material. Here it is all trimmed and ready for the binding. 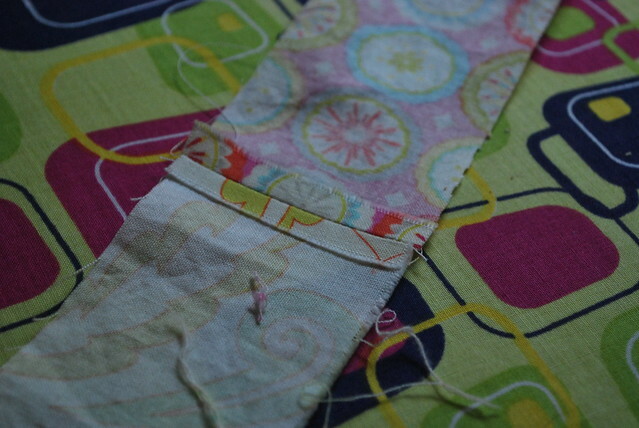 I used the leftover fat quarters and scraps from the quilt to make my binding. I determined that 10 22 inch strips and 10 18 inch strips would make the binding long enough with some excess to work with. 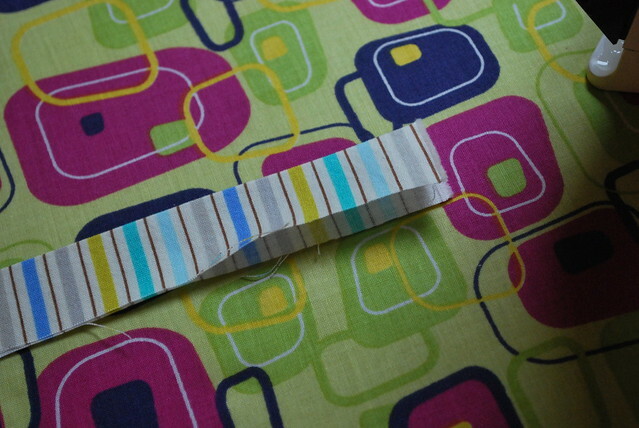 I made the strips 2.25 inches wide. If I had it to do over again I would do 2.5 inches though. 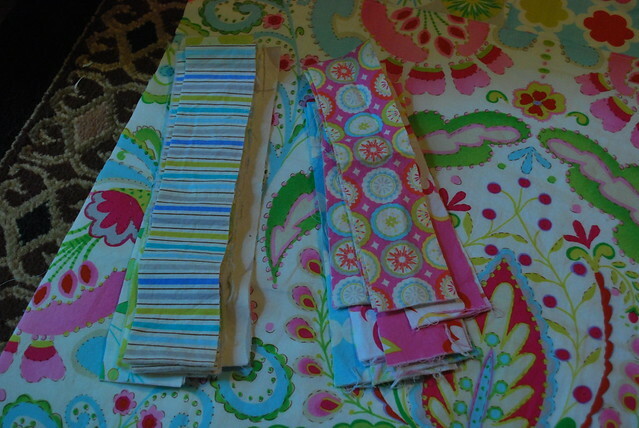 I sewed the strips together alternating 18 inch and 22 inch pieces. I also tried to distribute the colors evenly. 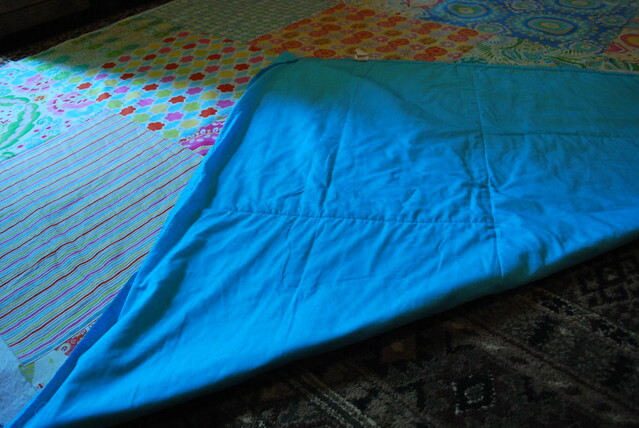 Then I laid it out on the quilt to make sure it fit all the way around and also to get an idea of where to start attaching it. Then I ironed the seams open. Then ironed it in half. Here is my lovely pile of binding. 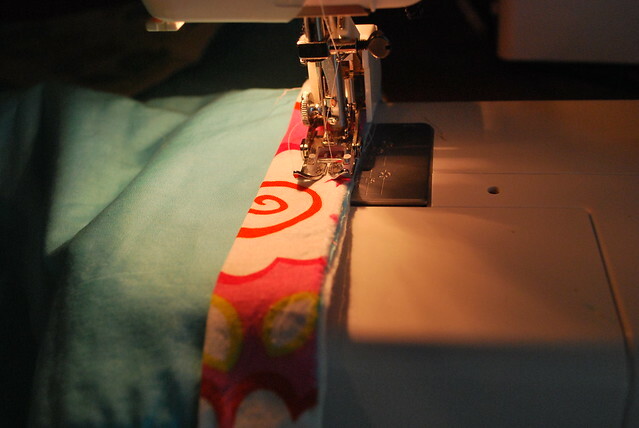 I decided to attach the binding to the back and then bring it around to the front and topstitch it. I just could not imagine hand stitching the binding on and I knew that I would be able to make the topstitching neater on the front. So I lined up the raw edges and stitched the binding on all the way around mitering at the corners. 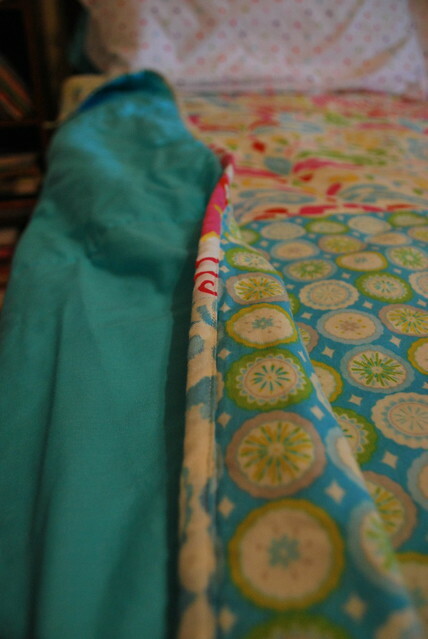 Then I flipped the quilt over and brought the folded edge to the front and topstiched all the way around again. Ta-da. All finished. I know I broke about every quilting rule, but I am ok with that. 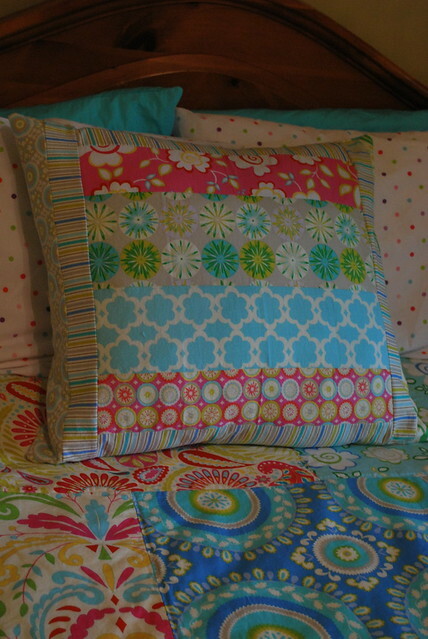 I used some of my scraps to make this pillow to match the quilt. I almost used every bit of the fabric. Gotta love that!! 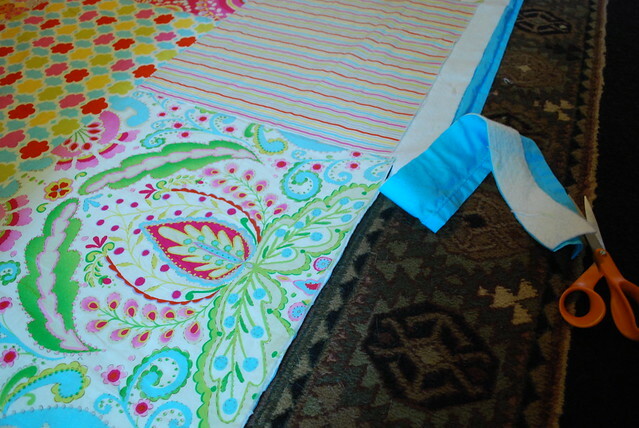 In case you missed it, here is Fat Quarter Quilt Part 1. THis is just beautiful!! I love the patterns you chose!! I LOVE THE QUILT!!! Great job. I know Harper must love her new bedding. Who cares if you broke rules? I say, throw out the rulebook if you can create beautiful things like this. So lovely! This turned out lovely. :) I bet Harper loves it. Oh my goodness, that looks absolutely FABULOUS! Not that I had any doubt that it would, but wow -- I am even more impressed that this was your first attempt! Um...what rules?? :-) Jen! It is beautiful! I love the binding and that fabric is just TO DIE FOR! It really turned out great! Well done. 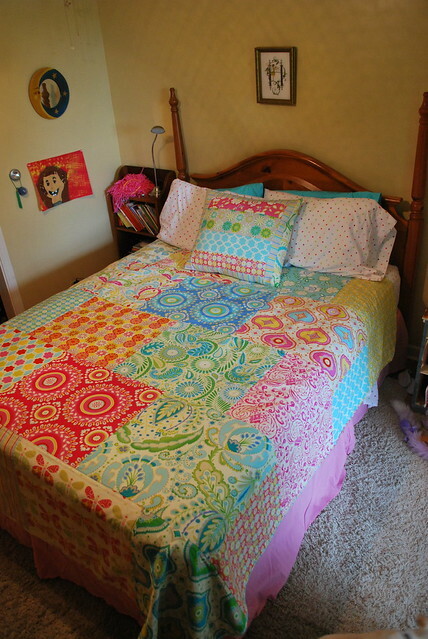 Your quilt turned out AWESOME! LoVE it! Holy...you just made the binding look so simple. It's something I've struggled with and now I want to rush home and try to do it! Thanks!!! heh. you followed all the rules , in fact. the rules are: Piece. Quilt. Bind. you did all of them. 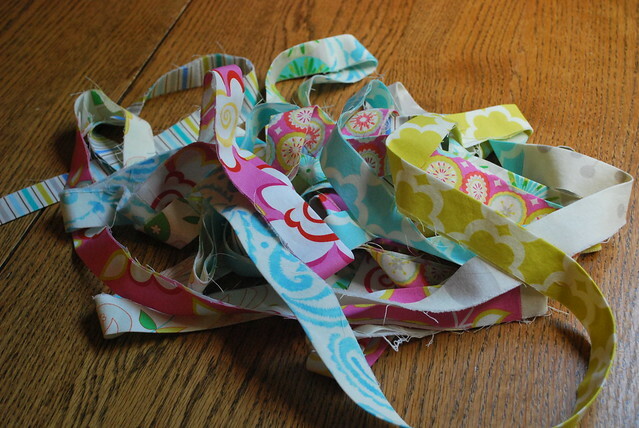 I love that you did not go through the cut-it-into -pieces-and-stitch them -back-together thing that most "quilters" do. wonderful look for the bed. good job! 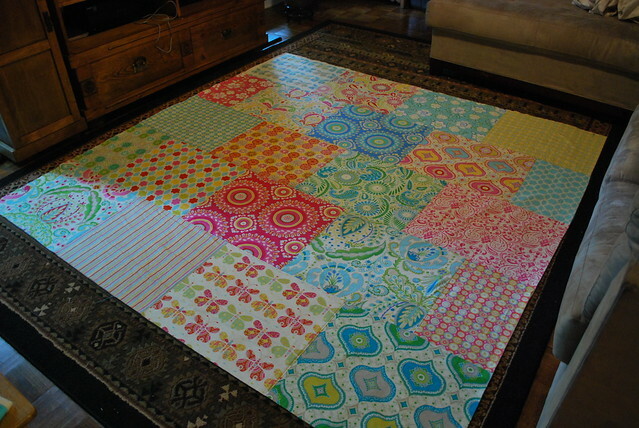 What a genius way to do a first full sized quilt. Love it! I love how this turned out ! 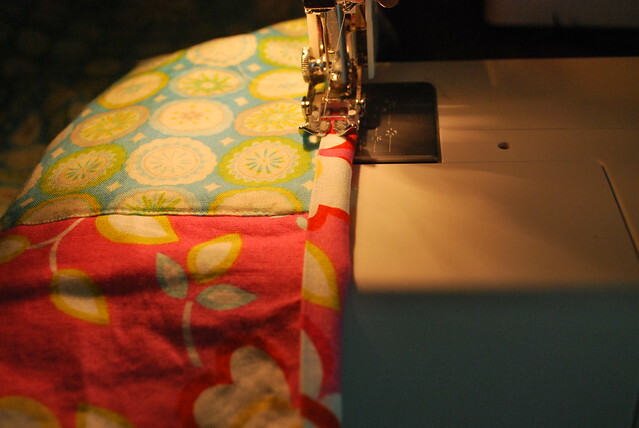 I am really not into sewing small pieces together and then have them not line up , and I have not mastered quilting yet either ; and oh , I do my binding all on the machine as you did ! 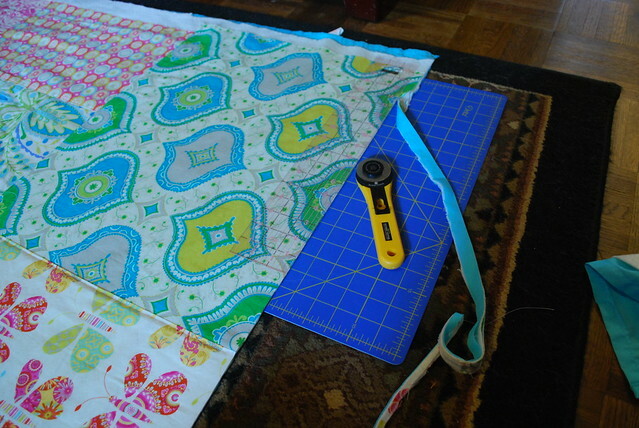 so I am a break the rules quilter also ! Love this! What size bed and how many squares did it take? Thankx for sharing. It's really quite lovely ... and the pillow is like icing on the cake! This looks like a fun project. I will have to give it a try. 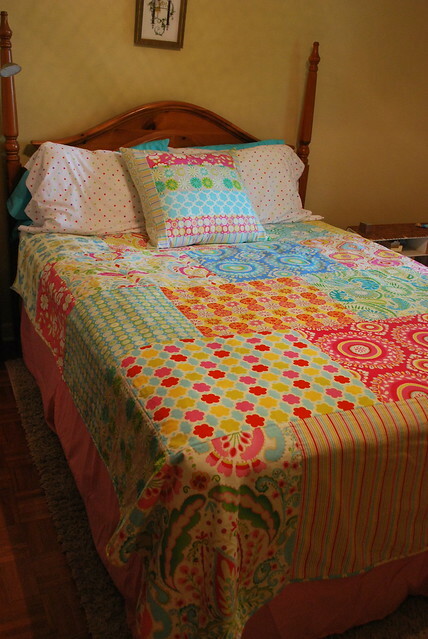 Your quilt turned out so cheery and bright. Love it! came to your blog for doll stuff, i'm happy i found it. Did you have to sew all the squares together before putting the front and back together? Is this a queen sized bed? How many fat quarters did u use? Thx!!! I just started quilting, and I absolutely love this one!!! I'm adding it to my ever-growing list of sewing projects! 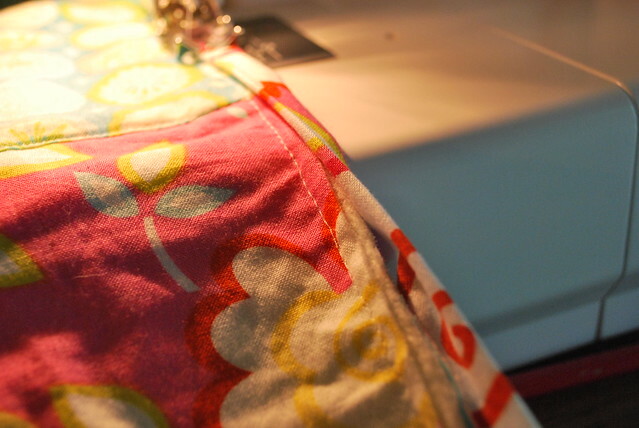 I've been sewing for 30 years, and I say, there are no "rules"! Just do what works for you! It's what makes it special! Again, I just love this quilt! Especially the way you did the binding! I found this on Pinterest and love it! 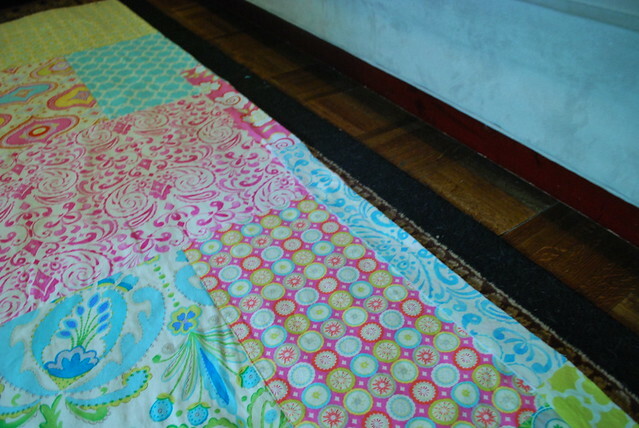 I want to make a quick patchwork for my bed and never though of using such big pieces. Love your colors! I love when I am looking for a project online and I end up on your blog. Hope you and your family are well!